Christian Preschool Alpharetta: Is a Christian Preschool Right For Your Child? Why Send Your Child To A Christian Preschool? Sending a child to preschool is a difficult decision for any parent. After all, first you have to ask yourself the most basic question: is it something you’re going to do? We know that just because you’re on a preschool website doesn’t mean that you’ve made up your mind whether or not to send your child to a preschool. After all, a parent or guardian must ask themselves certain questions before sending them off to an early education center. Is Preschool Right For the Child? Each child is unique, and it’s not just us who says so. Scientists know that every experience changes a child, and God himself knows the number of hairs on their head. Most children thrive in a preschool environment. They get to socialize with other children, play indoor and outdoor games, and simply have a great day each and every day. A few children will show some reticence at first, but then be perfectly happy once they settle in. There’s the occasional child for whom preschool just isn’t the best fit, but those are few and far between. We’ll do everything we can to accommodate every child and work with the parent to make the most of their child’s time at our Christian child care. Many parents who think their child might not be ready (or a good fit) preschool. If there’s any question, why not tour the facility and see how the child takes to it? These same parents are often surprised to find just how much their child takes to a preschool environment. Is Preschool Right For You? Sometimes it’s the parent who isn’t ready to let a child go to preschool just yet, and we understand that. Parenthood is a special bond between parent and child, and letting someone else take care of your child for an extended period of time can be a big step for some parents (especially first-time parents). While we extol the virtues of preschool programs, we also understand that a parent has to be ready to let a child attend. In the end, you simply need to do what’s best for both you and the child. If that means enrolling them in our early childhood education programs, we’re more than happy to welcome them into our private preschool. Is Preschool Right For the Family? We fully understand that preschool and daycare are choices for some families and necessities for others. Some parents will choose to put their child in preschool in order to work, while others have to do so in order to make ends meet. Every family has to do what’s right for each and every member. With so many children in our preschool programs, you won’t be surprised to find out that we see an amazing variety of family dynamics as we welcome parents and children into our daycare center. Sometimes it’s the same parent picking up a child, other days the parents flip-flop days. Other times a grandparent is involved. We love the variety of types of families we see, and if preschool is right for them then it’s right for us! Why Choose A Christian Preschool? If you’ve decided that a preschool is the right choice for your child and your family, then the question arises: is a Christian preschool the way to go? We won’t tell you that we’re not biased, because we are! We truly believe that raising a child in a Christian environment is the right decision to make, because constant references to the Faith throughout the day is going to help a child in their present and in their future. Let’s take a look at what children will get when they attend a church preschool or Christian preschool. As a Christian preschool and daycare center, you won’t be surprised to know that one of our favorite Bible verses is Proverbs 22:6: “Train up a child in the way he should go: and when he is old, he will not depart from it.” At Children’s Ark Academy, we truly believe that that’s the case for nearly every child who passes through our doors. We believe that a good Christian foundation is something that every child deserves. It’s also a craving that God puts in our hearts to know Him better, so giving children these answers early on can solidify that foundation and give them something to build on later in life. Will there always be aspects of the world that cause some children to go astray? We all know that there are. But the foundation gives even the most troubled child something to return to. Starting them on the Rock means they’ll always have a place within that’s filled with Jesus. What if you’re not a church-going family? We know that not every family who brings a child to our early childhood education center is heading to church every Sunday morning, but something simply draws them to bring their child to a Christian preschool (we’re pretty sure we know Who it is!) The fact is, some of our parents go to church multiple times a week and see us as a nice Christian addition to their child’s education. In other cases, we’re the primary source of God conversation in the child’s life. Either way, we’re happy to play a part. We want every child to grow up in a house where God is talked about every day. If that’s not the case, then we hope to provide the child with the basics of Christian education so that they’re the ones bringing up God once they get home! When one child does something wrong to another child in class — for instance, if they take a toy from another child — we have so many ways to deal with the problem. We can talk about the other child’s feelings or the earthly-reasons that it’s wrong to steal. Of course, there’s one more reason that we shouldn’t take from others: God tells us not to. We can use the situation as a teaching tool for each child, giving them specific Biblical reasons for the way in which they should act. And that’s not something that every preschool or daycare can do. As we discussed above, we believe that each child is special. It’s not just us who believes that, but it’s true in God’s eyes as well. We look for the special aspects of each child and find the best way to teach them. No matter their age, we know that they are precious. At our Christian preschool, we can tell children about how special they are to us, their parents, and to God. When children know this, it gives them the confidence to do more and to live life knowing they are loved. In most preschools, you’re going to see a lot of stuff hanging on the walls. Sometimes they’re posters extolling the virtue of reading, or telling kids that math can be fun, or how important it is to share. In most cases, you’re going to find a lot of crafts on the wall that the kids have created. You’ll find all of those in our Christian daycare as well, because we believe in nurturing a child’s curious mind as much as any institution. But you’ll also find quite a few posters and other wall hangings that are religiously-based as well, those that might have scenes from popular Bible stories. You might see a poster of Daniel in the lion’s den or one of Noah and the Ark (one of our favorites for some reason!). You’ll also find that the children’s craft of the day might be Biblically-based as well, because we’re always looking for ways to make Bible stories come to life. We certainly never hide the fact that we’re a Christian business. In fact, it’s obvious from the first time you meet one of our workers. You’ll certainly hear a “God bless you” if someone sneezes, and you’ll probably hear someone say goodbye with “have a blessed day.” Sure, these are little things, but it’s just one way that we show our Christianity and reminds kids of the kind ways in which people should treat each other. It also lets kids know that it’s okay to say Godly things in public, that’s it’s okay to stand strong in your faith! We hate to imagine how difficult it is to run curricula during Christmas and Easter for anyone who works at a non-Christian preschool! Sure, these holidays have become secularized with Santa Claus and the Easter Bunny, but there are still a lot of religious ideas that are pretty hard to avoid when telling stories and doing crafts. That’s something we don’t have to worry about here at our Christian daycare. Want to talk about the star at Jesus’ birth? Interested in talking about the true meaning of Easter? We don’t have to avoid the real reasons for the seasons, and that’s an aspect that many parents are very happy with. 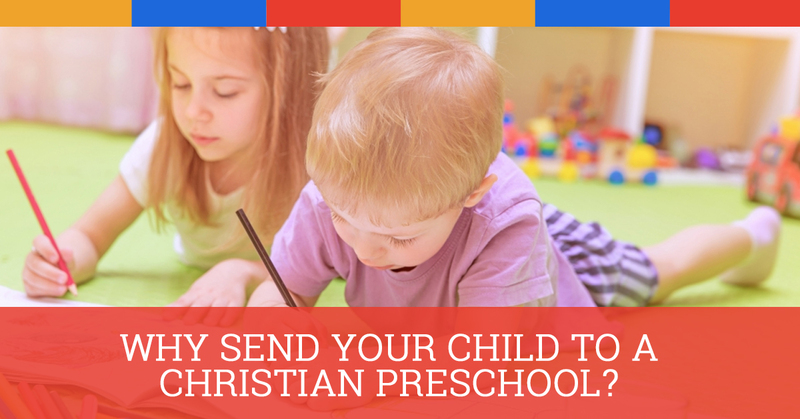 …why choose a Christian preschool? Raising a child in a forgiving, loving Christian environment provides them with a firm foundation of their religious and moral self, one that will stay with them for their entire lives. Whether we’re providing the bulk of the Biblical teachings or are simply a way to reinforce the ideas on a daily basis, we’re proud to be a part of so many kids’ Christian upbringing. If that’s something you’re looking for in your child’s life, we hope that you’ll schedule a tour of our Alpharetta early education center. Running a Christian preschool means not only teaching kids everything they need to know to be ready for kindergarten. It also means knowing the best way to work Jesus into each and every day. Of course, not every age will be told about Jesus in the same way. Here’s what children can learn at each age level. While infants have their own way of communicating, they certainly can’t talk. But one way that they do learn to talk is to by being talked to, and that’s something we’re always doing here at our Christian preschool. We’ll talk to them while we’re playing, having tummy time, or changing their diaper. We will even teach pre-verbal children the most basic signing so that they can communicate their needs. Everything is programmed to stimulate all five of baby’s senses every day, and that includes outdoor time (as weather permits). Because babies are like sponges, their brains are always working to figure out what they’re hearing. That’s why we tell them about the love we have for them, the love their parents have for them, and, of course, the love the God has for them! We can talk to them or sing it to them, and the attention they receive ensures that they are always hearing about God’s love. 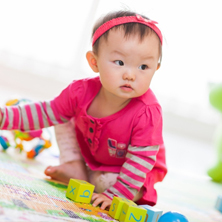 Find out more about our infant daycare here. Toddlers are so wonderful because of their budding conversation skills. We love being the ones to help them grow their little brains by interacting with them, because we know that hearing words on a video just won’t cut it; they need interaction with us and with the other children in the room. There are just so many ways for them to learn throughout their days with us, and we provide small-group activities, free-play, music, movement, outdoor play, and quiet time. 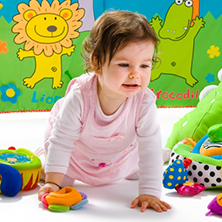 We have a number of learning and play centers around the room to help them make the most of their growing brains. It’s at the toddler stage that children start responding to us verbally, and when they start talking they can respond to us when we talk about God. It’s at this stage that children start having slightly longer attention spans, where we can read classic board books to them and talk to them about Bible stories. Children at this age also get much more mobile, which means that they’re interacting with the room more. They’re able to head to their different posters and point, and when you work in a Christian preschool you can guess what most of those posters are about! Our daycare surrounds the children with God’s love (and God’s posters!). Learn more about our toddler daycare by clicking here. Every stage of childhood is fun, but it’s hard to beat working with two-year-olds! It’s at this stage that their personalities really start to shine. They start to wonder about the world around them, how stuff works, and why things are the way they are. They become easier and easier to converse with as they develop their verbal communication skills, and we also work with sign language to further stimulate their growing brains. Reading and writing skills are at the forefront of their traditional schooling. It’s at this stage that we start to have activities in the classroom at specific times, as the kids benefit from more structure. Of course, they’re also getting more and more curious about the Bible and the stories therein. They no longer just absorb the stories, but they can answer simple questions about them and even ask questions about aspects of the story they might find confusing. There are also singing and art projects that can have Biblically-centered themes. If you’re interested in learning more about preschool for two-year-olds, click here. Kids at this age are so smart! We’re constantly amazed at what kids have learned in just the first few years of life. It’s at this stage that we ramp them up to get ready for kindergarten, and we’re there to get them ready with our private Christian Pre-K. That means language arts, fine motor skills, gross motor skills, math, science, art, dramatic play, and more. We also get them started on Spanish as a second language. And while this might sound overwhelming for four and five-year-olds, don’t worry; it’s all framed properly for their age, and they have great fun doing it. When it comes to Biblical teachings, this is certainly the age at which the phrase “out of the mouths of babes” is most appropriate. This is the point where they really start to grasp the concept of the Bible stories we present to them, where they’re able to ask the tougher questions and respond in ways that truly surprise and amaze us. Kids can sum up Bible truths so succinctly, and we love working with them to continue to let them know about God’s plan for each of them. Learn more about our Christian Pre-K preschool program right here! Which Christian Preschool Is Right For You? As you’ve read through this page, we hope we’ve answered most of the questions you have about what’s it’s like to have your child at a Christian preschool. After you’ve decided that preschool is the right decision for the child and your family, making the choice for a Christian preschool is an easy decision for many. Sending a child to a Christian preschool means that they’re going to get a firm foundation of God every day, where kids are surrounded by decorations and people that deliver God’s message. Whether you go to church regularly or not, your child will be hearing the good news every day. We’d love to show you everything our Christian daycare and preschool have to offer, so why not take a tour? 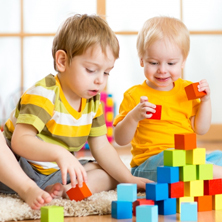 Just contact us today and we’ll set up a time where you can see our daycare center in action!